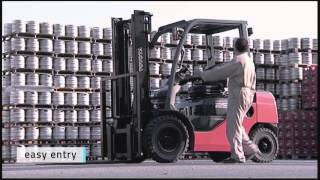 Looking for an engine-powered forklift that’s both productive and reliable? The Tonero LPG trucks are ideal for intensive work both indoors and outdoors. Safe manoeuvrability and fast acceleration make the Toyota Tonero highly productive in a range of material handling applications, from light to intensive. Designed in-house, the engine is specifically designed for industrial applications and allows quick acceleration and optimised fuel efficiency. The fully adjustable seat with side-wings and lumbar support, the large leg room, and adjustable steering column offer every driver an ergonomic experience. The clear-view mast and overhead guard give operators an excellent view of the load and environment. The Toyota Tonero models up to 3.5 tonnes with torque converter transmission offer stability and productivity during light to heavy-duty outdoor applications. The low truck noise and vibration, as well as the wide range of cabins contribute to driver comfort. These fast and manoeuvrable models are available with industrial diesel or LPG engines. We also offer IC trucks with cushion tyres for narrow indoor operations.